‘MIAMI VICE’ has been incredibly significant. It was not merely a TV show; it changed the world, yet it remains relatively unheard of these days. I think it is high time this TV show got the credit for the massive cultural impact it has had ever since. MTV was making good ground, and the US American TV company, NBC, wanted an MTV style Cop show. This would be ground-breaking in itself — it would mean fast editing, strange camera angles, and all the effects and styles of TV adverts and pop videos — and possibly a great soundtrack too. Already, and just at this first idea stage, it was going to be a revolution. The early 1980s was an interesting period — there was such an high degree of uncertainty that a lot of bad choices were made. The increasing visibility of ‘homosexuality’ and ‘lesbianism’ with the new ‘GAY’ parades shook the post-punk new romantics. Skinheads and break-dancing rappers hardly offered a viable alternative. 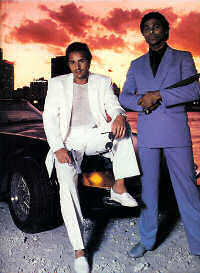 What ‘Miami Vice’ did was bring clarity to the period. ‘Miami Vice’ clicked with the MTV generation — but it also caught other waves too — the rise in boy’s toys, the deregulated financial markets led to a boom time and the YUPPY — “Look at my Wad” shouted comedian Harry Enfield in a time where it was suddenly OK to flaunt your cash, dress well, drive flashy cars and … “groom”. It was genius not to set the show in New York or California. Miami was new to the world’s TV viewers, and it offered a whole new view of the USA — Miami’s pastel coloured Art Deco buildings had as much of a starring role as the actors! So that was the new idea — a COP show in the MTV style set in the pastel-coloured Art Deco Miami to a great soundtrack. But that is not enough. The stories were modern — instead of the usual druggy undercover cop, the show switched it round to being incredibly rich undercover! The fast cars, speed boats and big yachts were police property — Oh, this was like James Bond’s lifestyle and gadgets — only more feasible somehow! The next stroke of genius was the casting of TWO men, one black and one white (in stark contrast to their pastel surrounds). This was a revolution — they were equal, they were friends. Wow. Their boss was Hispanic! The show was addressing BIG issues. It somehow managed to completely avoid women as eye candy. All of the above is well-known and probably easily found on the Internet, and while it may well be that this TV show changed a lot in terms of TV shows or TV cop shows etc, it is not of much more than a passing interest to most people. 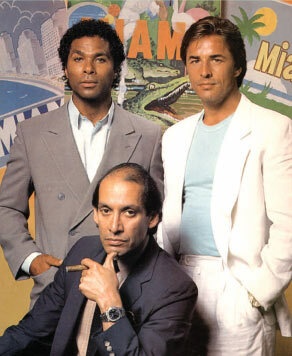 What the show actually did was astounding; up until ‘Miami Vice’ no adult man would ever wear anything PINK. Never. As a result of Don Johnson’s Sonny Crockett character, and from 1984, men started wearing tee shirts with suits! Suits got lighter (some were even PINK) and they made suits look cool and fashionable. Jacket sleeves got rolled up, no belts or neckties, collars turned up, shoulder pads added, and men all over the world stopped wearing SOCKS! Ricardo Tubbs (played by Philip Michael Thomas) was the cool black friend, but Johnson managed to steal the show on fashion and accessories alone. Crockett was who every man wanted to be and every girl wanted to be with. Up until ‘Miami Vice’ small children would pretend to shoot pistols in the style of movie cowboys and TV cops — one handed, just above the holster — but after ‘Miami Vice’ a pistol had to be used with two hands — and kids everywhere couldn’t enter a room without darting about like Crockett and Tubbs arms fully outstretched holding a shiny silver gun. Apparently (and as a result of this show), that shiny silver gun is the first choice even to this day with drug dealers and gangstas. Johnson managed to wear PINK without risking his manliness — and to this very day men wear pastel coloured shirts to work, and there is a large male cosmetic and grooming market. Johnson opened up the world of “real” fashion to “normal” men — not Punks or Hippies, but men who went to work in a suit. Ask yourself this: has there been a TV show before or since that has changed the world of men’s fashion so comprehensively? No. The ‘Miami Vice’ legacy lives on. Shudder to think of what the world would be like were it NOT for ‘Miami Vice’! I couldn’t agree with you more! The show was a trail”blazer”! I still remember taking the phone off the hook whenever Miami Vice was on! I have to mention “American Gigolo” as well: that scene with Richard Gere matching his shirts and ties struck a chord with more than a few clueless men about town when I was living in Vancouver, Canada. The show was groundbreaking in many ways. First, it brought serious attention to the pop culture of the day – music, music videos, and fashion. Secondly, the show was reknown for its unapologetic level of violence, cynicism of the materialism the 80’s. It simultaneously condemned and glamorized the dangerous high society lifestyle of cocaine in the 80’s. It changed the way TV was made with extraordinary high production values like a feature length movie. In terms of men’s fashion, I see a lot of 80’s articles which point to Miami Vice as the iconic fashion style of the mid 80’s but it was not. The pastel and unconstructed sportcoat with a T-shirt only lasted one or two years at the most during the peak of Miami Vice’s popularity and only a small segment of young males wore that style as it was expensive and impractical. Moreover, it became quite cliche within a couple of years. Nor did Miami Vice “invent” the T-shirt with sportcoat look as some articles incorrectly cite. Crockett’s style emulated the look of MTV stars of the day which included Huey Lewis, David Bowie, and Duran Duran wearing custom suits in bright colors. Even Eddie Van Halen wore his trademark “No Bozos” T-shirt under a red and black sport coat way before Don Johnson wore his T-shirt and sportcoat. In fact, you can go back to 1983’s Risky Business to see Tom Cruise sporting a T-shirt under a sportcoat and wearing Ray-Ban Wayfarer sunglasses. 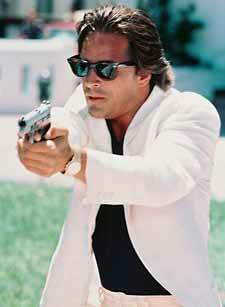 The one big thing that Miami Vice did do, was make men more conscious of what they wear. That is until, unfortunately, the grunge movement came about and men’s fashion deteriorated into hoodies, and disheveled looking denim jeans which sadly continues to this day.